Judea, Samaria, leaders demand government confiscate weapons in Arab villages, remove terrorists' families from Israel. Binyamin Regional Council Chairman Yisrael Gantz arrived at the scene of the double terror attack near Ariel, which harmed one of his area's residents. "Just a few days ago, missiles were fired at Tel Aviv, and now we have another shooting attack in the heart of Israel, near the city of Ariel," Gantz said. "We demand the Prime Minister tell the IDF to deal with the root of the terrorist infrastructure, and to completely clean the Palestinian villages of all weapons. We trust on the security forces to succeed in this task, if they are allowed to do it." 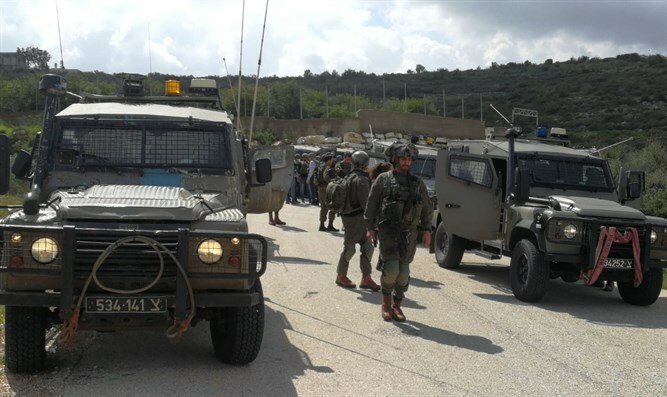 Har Hevron Regional Council Head Yochai Demeri said, "At this difficult hour, our hearts are with the IDF and the residents of Ariel and Samaria." "This week, we will celebrate the Purim holiday, which celebrates the salvation of the Jews. History repeats itself. Anyone who thinks that this struggle is over land is mistaken, misleads others, and pushes a solution farther away. "In order to deal with terror, the Israeli government must remove terrorists' families immediately, destroy their homes, make it clear that Ariel and Tel Aviv are equal, and apply sovereignty. "We send our condolences to the family of the victim who was killed, and we wish a speedy recovery to those injured." Beit El Council Head Shai Alon responded, "It has been a difficult morning in Judea and Samaria. There was another murderous terror attack, carried out by cursed and cowardly terrorists. I expect the next government to apply sovereignty here in Judea and Samaria. That way, we will be able to improve infrastructure and security." "In addition, we demand more checkpoints at Area A's exits. The terrorists use our lax security to the fullest." Arabs live in all three areas, while Jews live only in Area C, and are barred from entering Area A.